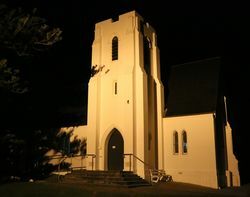 The Christ Church Bell Tower was erected to commemorate parishioners who served in World War One. Work commenced on the Bell Tower in 1922 and the foundation stone was laid by Sir George Fuller. The tower cost ₤700 to build and was dedicated by the Venerable Archdeacon W. Martin in 1924. On one side of the entrance is a marble scroll which contains the names of the men who enlisted. The other side of the entrance contains a marble scroll with the inscription. This tower is dedicated to the Glory of God and in grateful memory of the men of this parish who laid down their lives in the Great War, and of all their comrades in arms, who by Divine Grace were spared to testify to their glorious deeds.